So here you have it. 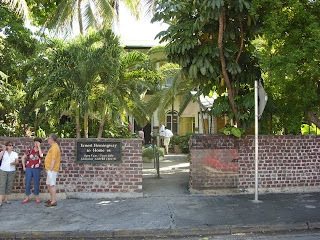 This is the front gate of the Hemingway House in Key West. The picture yesterday was a view through the side fence of the place looking through all the foliage. Here you see the front gate and front view of the place. Well you'd see the front of the house if you were on top of it. There are a lot of plantings there as are everywhere else this far South. All it takes is for a bird to pass a seed and you end up with a palm tree growing in a strange place in the yard. Give it enough time without pulling it out and it becomes a feature in your property.